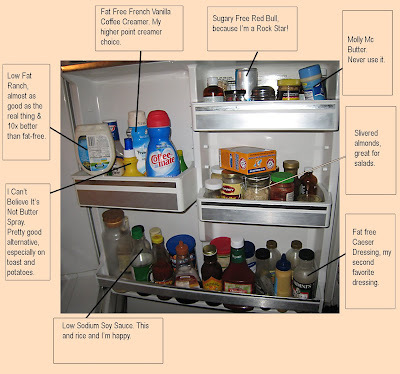 Diary of an Aspiring Loser: What's in the Fridge? Alright, you guys are going to think I've lost my mind but I'm getting bored over here. 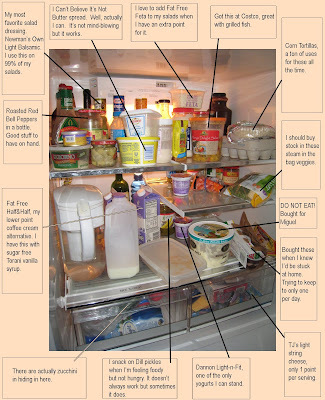 Wanna see what's in my refrigerator? How about my cupboards? Alright, if you promise not to judge me, at least not to my face, I'll let you peek. What can I say? I'm alone at home with a camera and time. I got bored. Here's the results. We'll start with my refrigerator. I want you to know I didn't touch a thing before I took the picture. I didn't remove any chocolate syrup or add the carrots. To see the whole thing much bigger just click on the image. Moving on to the fridge door. 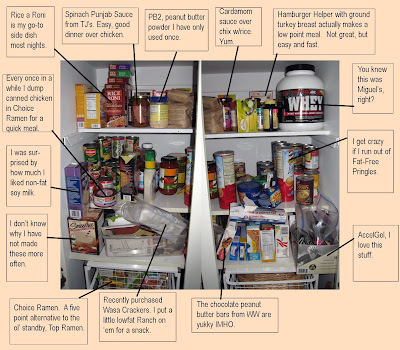 And finally, my cupboards. There are a couple of cupboards with spices, sugar, etc, that I didn't bore you with. Trust me, you aren't missing anything. Ok, it's over. Carry on. This is a fun idea, and I am glad you are keeping yourself busy! OK you're bored. When do you get to back to work. You're using your time creatively though, that's a plus. lolol...omg that is so funny. What a way to get your food hit, and much better posting them than eating them. That took up what? An hour or two?